U.S. Transit Agencies Face Tough Road to Open-Loop Fare Collection as Banks Shun Contactless EMV | NFC Times – Near Field Communication and all contactless technology. U.S. transit agencies are likely to have a more difficult transition to open-loop fare collection than their counterpart in London, Transport for London, since U.S. banks are not issuing contactless credit and debit cards, unlike UK banks, which have issued nearly 60 million contactless cards to date altogether. Moreover, using Apple Pay or other NFC wallets loaded with the bank cards is a nonstarter for riders to use at fast-paced metro gates, such as those of the New York City Subway, since they require users to scan a fingerprint or enter a PIN for each transaction. 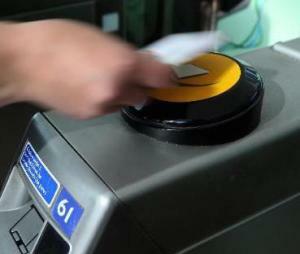 The difficult situation for open-loop fare collection in the U.S. may be one reason that a request for proposal, issued last month by the Los Angeles County Metropolitan Transportation Authority for a mobile-NFC pilot followed by a rollout, calls for using the same closed-loop Mifare technology as the agency uses for its TAP contactless cards­–not open-loop credit, debit or prepaid–either on cards or NFC phones.